Most of us would want God to answer us and do as we bid immediately we call on Him. Yet, God doesn’t always fix our problems as soon as we press His door bell in prayer. In fact, many Christians may have wondered whether God is mindful of time and season as they wait for what seems to them like eternity for Him to grant their requests. Actually, no one keeps to time like God. But, God doesn’t fix or reckon with time the way we do. So, our sense and appreciation of time differ from His. He hath made everything beautiful in his time, the scripture declares, and added that His thoughts are not your thoughts, neither are your ways my ways… For as the heavens are higher than the earth, so are my ways higher than your ways, and my thoughts than your thoughts Ecclesiastes 3:11; Isaiah 55:8, 9. There is no variation in God’s timing, unlike ours. His watch or calendar is set with divine precision such that He can neither act too late nor too early. 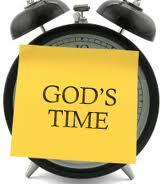 Consequently, those that come to God for help must be ready to calmly wait for His own time not theirs. Next What would you sacrifice for Jesus today?